EV Conversion Guide - Should We Use AC Electric Motor? EV Conversion Guide – Should We Use AC Electric Motor? Home/AC Electric Motor/EV Conversion Guide – Should We Use AC Electric Motor? I had one of my blog reader asked me a question couple of days ago, can we use [tag-tec]AC electric motor[/tag-tec] for our DIY electric car conversion? The straight answer is Yes we can. The more intriguing question is why aren’t a lot of people using AC (Alternative Current) electric motor for homemade electric car. I decided to read Les Oke’s Convert 2 EV for the answer. From Les’s EV conversion manual, one clear difference between DC motor versus AC motor is the cost. AC electric motor are more expensive and come directly with the motor controller mechanism. It has to be specially made for each motor and voltage used. Apart from the cost, there are many benefits of using AC. One of the biggest advantage of AC motors is that they can be used for braking as well, much like an engine or ‘jake’ brake on a big rig which slows the engine speed, thereby slowing the vehicle. One really cool aspect of using AC electric motor is that the energy used in braking can be converted into power to charge the batteries hence extending your DIY electric car drive mileage. This technology is know as regenerative braking. Apparently, the regenerative capacity of an AC motor is built into the controller, and that is why it is sold as a package, and also why the price is fairly steep. One of the reason why we want a homemade electric car is to save on our daily transportation cost. No doubt there are many benefits of using an AC electric motor as the power unit for a DIY electric vehicle. Unfortunately, the cost makes it impractical for a home electric car conversion project. 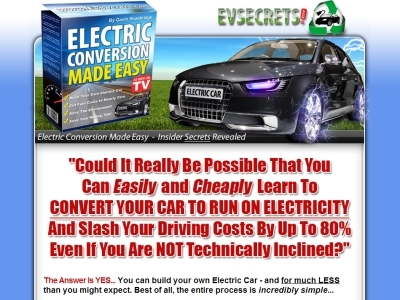 If you would like to find out more about AC electric motor for EV conversion, check out Gavin Shoebridge’s Electric Conversion Made Easy e-book. Gavin is from New Zealand and he has converted an old 1987 Mitsubishi Tredia into a pure electric car. 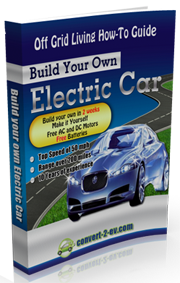 His e-book documents step-by-step what he did in his EV conversion project. If you prefer to learn from watching videos, Gavin’s manual also comes with 11 High Definition (HD) instructional videos. These videos are unique and you can’t find it anywhere else. Great article. Electric cars are the way to go. We have polluted the environment with all these gas-based vehicles. Now is the time for electric cars. I think this is very good for the future. Using electric cars could overcome environmental problems. Yes, we should be looking for environmentally friendly fuels. I can not imagine what happened in this world if my son has grown up…Thanks for the post.